A carp is an intelligent fish and it also has a memory. It knows what’s good and what’s not edible. Carp may test the food’s nutritional content, its taste or to determine if it has gone off. It may reject bait because it remembers that a particular substance or smell was previously accompanied by a hook. Like all creatures, carp have daily nutritional requirements for vitamins, minerals, proteins, amino acids (lysine and methionine), carbohydrates, oil and fibre. Carp can smell amino acids emitted by bloodworms, crayfish, and aquatic plants. Green-lipped mussel extract, kelp extract, liver powder and molasses contain sucrose and amino acids, which the carp has learned to recognise as having nutritional value. Some anglers use peanuts. While peanuts contain lipids, sugars and amino acids, these do not mimic the natural foods carp like. Carp love boilies, bread crust, meat baits, maize, fruity flavours (items containing vitamin C), stilton cheese, white fishmeal (herring meal is very desirable to carp), full fat soya flour, lactalbumin, rennet casein, robin red, hemp and seaweed extract. The best items are those that either emit favourable smells or contain ingredients which mimic them. Carp will also eat flavoured imitation baits. When boilies fail to attract them, artificial corn will usually work. Zoom Carp Snacks have been used successfully by many carp anglers. The snacks come in honey, vanilla, strawberry and chocolate flavours. What works one place at one time of the year will not necessarily work at another or during a different season. Anglers often use easily digested food/ingredients in bait during the winter because carp don't move much due to the cold conditions. In the summer months, when fish are more active, anglers should use more protein in their baits. Older carp, however, require less protein. A Good Bait Will Catch Carp Every Time! There are shelf life boilies and there are the homemade varieties. Generally, if you make your own boilies they should work out cheaper and if done correctly, some anglers swear, more effective. You must make up your own mind on which is best for you and your situation. At the time of writing, Mainline makes boilies in several different flavours that are attractive to carp. These include Strawberry Jam, Sweet Pineapple, Tiger Nut, Tutti-Frutti, and Halibut. The 18mm versions are designed to catch in all fishing situations. Newfields makes Fire and Ice (F&I) boilies. They are a blend of marine proteins, milk protein, vegetable extracts, kelp, belachan block, hot chilli powder, spices and betaine. F&I boilies are available in 14-24mm sizes. They are designed for year round usage and are especially valuable in the cold winter months. Making a boilie at home is akin to making a cake. You mix 6-10 eggs; flavours and additives; liquids; maize, corn semolina, soy flours; powdered milk and sugar to form a paste. Almond essence, liver flavour, anchovy concentrate, squid, octopus, amino acids, peach and pepper flavours, betaine, shellfish, plum, fruit, green lipped mussel, red salmon oil and curry powder are particularly effective additives. The mixture is rolled into a ball, placed into a fry basket and then boiled for 1-3 minutes. The finished boilies are dried on paper for 2-3 days. They are now ready to use or they can be stored in the freezer. There are various types of boilies depending on the materials used. High Nutritional Value (HNV) boilies incorporate a range of ingredients that benefit the fish in some way. A typical HNV mix will include digestible or predigested casein's, proteins, vitamins and minerals. An angler making his own boilies can add other flavours, colours, and enhancers. The drawback to HNV baits is that they are expensive. Best results using HNV boilies are achieved from June to November. High Attract (HA) boilies are generally buoyant. They are normally used as a single hook bait (no free offerings around the hook bait). The HA boilies are over flavoured, producing a brightly coloured bait that stands out from the lake bed. The high level of attraction is produced with the aid of a bait dip, soak or glug. The baits are very effective all year round, but especially so during the really cold winter months when the carp don’t want to get their heads down to feed. Soluble boilies are not used to place the hook in the carp’s mouth. Instead, they dissolve and form a particle layer on the bottom with an intense scent that cause the carps to investigate. They have delicious flavors, usually wheat, maize, or cinnamon amongst others. The soluble boilies are made without eggs. The flours, including portions of salt or sugar, are mixed with water or with milk. The boilies are not cooked and left to air dry. Non-soluble pellets are made the same as regular boilies. Instead of being rolled into balls, they are formed into long cylinders, cut into sections, cooked in water, and dried on paper. Particles refer to seeds, nuts and grains that are used as either hook bait or groundbait. The best known and most widely used is maize. It makes a great bait after soaking and boiling. Tiger nuts are brown nuts with a very rough texture. They are one of the hardest particles around and must soak for 24 hours before being boiled for 30 minutes. The prepared nuts are best when left in the water for 2-3 days after boiling. The water is turned milky white due to sugars in the nuts. Two nuts on a hair rig are excellent as a bottom bait. To make a pop-up (buoyant bait), sandwich a piece of cork shaped like a nut between two nuts on a hair rig. Other particle baits include hemp, hempseed, maple peas, and lupins. Flavorings, dips and additives make particle baits more attractive to carp. One of the best commercial particle baits is WackerBlendPlus. Groundbait is made from different kinds of natural ingredients such as bread crumbs, hemp, walnut flour and so on. It is moistened with water, formed into balls and thrown into the water where you plan to fish. The carp are attracted to the smell and clouding of the water. One of the best types of groundbait is made by van den Eynde. 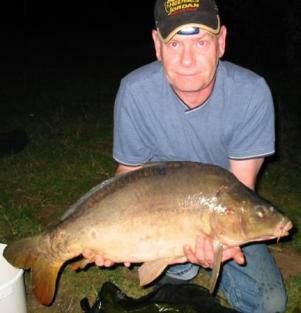 There are numerous groundbait fishing tactics helping to catch more carp! The diet of small carp includes black midges and animals without backbones ½ millimeter+ long (the size of a pencil dot). These animals live on rocks, logs, sediment, debris and aquatic plants during some phase of their life. They include crayfish, clams, snails, aquatic worms and the immature forms of aquatic insects, such as stonefly and mayfly nymphs. There are a number of live baits that you use to catch carp. These are the same creatures that carp would find in the water. Mainline makes bloodworm extract stik pellets, which easily break down and draw carp to your baiting area. Dynamite Baits makes fishmeal boilies containing flavours that carp like, such as crab, shrimp, octopus, halibut, oyster, and chicken. URL: http://www.geocities.com/diabolo38/bouille.html [Accessed April 1 2007]. URL: http://www.geocities.com/secarping/nuts.html [Accessed April 1 2007]. URL: http://www.geocities.com/jstevens_uk/bait_boilies.htm [Accessed April 1 2007]. URL: http://www.geocities.com/newfieldsbaits/nbs.htm [Accessed April 1 2007]. Very Often Different Carp Baits will Produce Different results!